CIPA, the Japanese Camera & Imaging Products Association, has released its numbers for July and things don’t look terribly rosy. The summer months are generally a slower time of the year for most retail sectors, but in terms of camera shipments this past July has been much worse than in 2017. Compared to last year, shipments of all digital cameras are down 33%, dropping from 1,942,192 to 1,496,604. 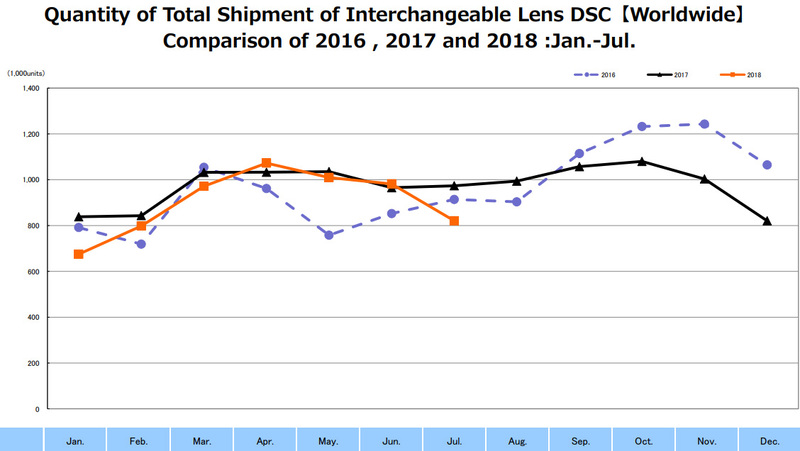 Things look only slightly better in the interchangeable lens segment where we have seen a smaller drop from 973,651 to 820,893 units (down 16%). The numbers look particularly bad in part because summer shipments in 2017 were strong – or at least, didn’t dip as dramatically as they have in 2016 and this year. And on the plus side, the industry can now look forward to the traditionally stronger autumn months and the holiday season. The recent high-profile product launches from Nikon, Fujifilm and Panasonic, plus any new products that might be announced at the upcoming Photokina trade show, will likely have a positive impact on shipments for the remainder of the year.